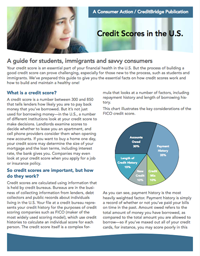 Consumer Action - Credit Scores in the U.S.
Credit Scores in the U.S.
Establishing credit and building a good credit score is essential, but it can be challenging for consumers who are new to the process, such as students and immigrants. This publication explains what a credit score is, how it is used, how to find out where you stand and what specific steps you can take to build a credit history or improve your score. Your credit score is an essential part of your financial health in the U.S. But the process of building a good credit score can prove challenging, especially for those new to the process, such as students and immigrants. We’ve prepared this guide to give you the essential facts on how credit scores work and how to build and maintain a healthy one! A credit score is a number between 300 and 850 that tells lenders how likely you are to pay back money that you’ve borrowed. But it’s not just used for borrowing money—in the U.S., a number of different institutions look at your credit score to make decisions. Landlords examine scores to decide whether to lease you an apartment, and cell phone providers consider them when opening new accounts. If you want to buy a home one day, your credit score may determine the size of your mortgage and the loan terms, including interest rate, the bank gives you. Companies may even look at your credit score when you apply for a job or insurance policy. So credit scores are important, but how do they work? Credit scores are calculated using information that is held by credit bureaus. Bureaus are in the business of collecting information from lenders, debt collectors and public records about individuals living in the U.S. Your file at a credit bureau represents your credit history for the purposes of credit scoring companies such as FICO (maker of the most widely used scoring model), which use credit histories to calculate an individual score for each person. The credit score itself is a complex formula that looks at a number of factors, including repayment history and length of borrowing history. 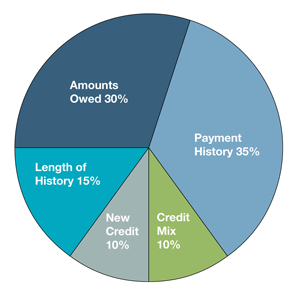 This chart illustrates the key considerations of the FICO credit score. As you can see, payment history is the most heavily weighted factor. Payment history is simply a record of whether or not you’ve paid your bills on time in the past. Amounts owed refers to the total amount of money you have borrowed, as compared to the total amount you are allowed to borrow—so if you’ve maxed out all of your credit cards, for instance, you may score poorly in this category. Three other factors, credit mix (types of accounts, such as mortgages, retail accounts and credit cards), length of history (the longer, the better) and new credit (multiple recently opened accounts represent higher risk), are also considered. Under U.S. federal law, you are entitled to a free copy of your report from each of the three major credit bureaus once a year at AnnualCreditReport.com or 877-322-8228. This source does not offer free credit scores. However, many banks and credit card companies now provide one to their customers at no charge. Otherwise, you can purchase your score at AnnualCreditReport.com, myFICO.com or the website of each of the three credit bureaus (Equifax, Experian and Transunion). Beware of offers of “free” credit scores. Many such offers enroll you in a monthly fee-based credit monitoring service. What if my credit score is low, or if I don’t have one at all? Credit scoring is hardly a perfect system. Your history of borrowing is the biggest factor in your score, but what if you’ve never borrowed before? Students and immigrants to the U.S. often have low credit scores, or no scores at all! Victims of identity theft may have suffered damage to their credit score. And anyone who has experienced bill payment problems in the past is likely to have a score that is less than ideal. But never fear, by taking the right steps, anyone can build or improve their credit score! So what should I do to build a credit history or to repair one if it’s not good? Thankfully, there are a few tried and true ways of building a good score. The key is to have as much positive information reported to the credit bureaus as possible. These techniques generally fall into three categories: 1) responsibly borrowing and repaying small credit accounts (like credit cards); 2) reporting recurring non-credit payments to the bureaus; and 3) fixing errors or blemishes on your credit report. Responsibly using small credit accounts. Using a credit card and paying your balance each month is a great approach to building credit. Of course, failure to pay on time can hurt you, so make sure to use the card responsibly. The size of your credit limit will be determined by the strength of your credit score. If you have no score at all, you may not qualify for a regular credit card. In that case, some banks may offer what’s called a “secured” card. Secured cards are also a great way to build a credit history—in fact, they’re just as effective as a regular, unsecured credit card. The difference is that secured cards require a cash security deposit that the bank holds in case you don’t pay your bills. Over time, if you use the card responsibly and pay your bills by the due date, the bank typically will refund the deposit and upgrade you to an unsecured credit card. Another strategy is to become an “authorized user” on another person’s credit card account. There are no requirements to qualify as an authorized user, and you’ll build a credit history with each on-time monthly payment, as long as the company reports authorized user activity to the credit bureaus (local banks and credit unions might not). Likewise, your credit will suffer if the account owner pays late or not at all. Getting a co-signer on your account can also help, but keep in mind that you can hurt your co-signer’s credit history if you miss payments. Besides credit cards, there are other loans available to help build your score. Consumer loans for purchases like appliances or air conditioners work. There are also “credit-builder loans” offered by some credit unions and alternative financial institutions like the Mission Asset Fund. These are small, short-term loans with low interest rates made primarily to build credit history. Just about everyone pays monthly bills, but often, regular payments are not reported to the credit bureaus. If you rent your home or apartment, you may be able to report rental payments to the bureaus using new online services such as RentTrack.com. There is a small fee, but sometimes it’s covered by your landlord. Repairing past-due accounts or correcting inaccurate information on your credit report. Repairing a damaged credit history is harder than building one from scratch, but it can make a big difference. First, you should examine your report for errors. If you find one, you should promptly dispute it with the lender or collector that reported the inaccurate information. “Furnishers”—those who report information about consumers to the credit bureaus—are required to respond and substantiate their claims against you under U.S. law. Second, if there are negative marks against you from unpaid bills or items that have gone into collections, you may benefit from a technique called “pay to delete.” This involves calling the lender or collector and offering to pay the debt off immediately if they agree to remove it from your record. This technique is controversial, but some people find it effective. If the creditor does not agree to remove the item, the only way that negative but accurate account information will be removed is when it drops off your report, typically within seven years. However, the last 12 months of payment history carries the most weight, so derogatory (negative) items will have less bearing on your score as they get older. Building your credit history can be time consuming, but with some patience and thought, you can do it! Common sense is a good guide to building your credit history. Creditors want to see that you have a history of paying your bills on time, every time. So the key to a strong credit history is making your required payments on time. We hope that this guide will help put you on the path to great financial health! To learn more, check out Consumer-Action.org and CreditBridge.com!